All of our Christmas trees are free standing so that you can see the entire tree on all sides to help you make your selection easier. We have many trees under roof so that you can see your tree dry and free from snow and ice accumulation. We are proud of our selection and services and many customers who came with their parents to choose their tree years ago now bring their children to continue the tradition. Just please do not tease Jim about his age! These royal beauties are shipped to us from Washington state. This tree has a horizontal branching structure that is great for holding many ornaments. The branches are very strong so they will hold larger and heavier ornaments. 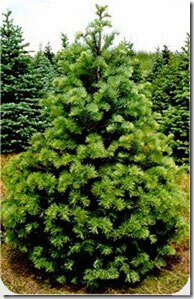 It is a deep green color and has a strong pine scent with short, soft needles. The Noble Fir has a lot of history. The first ships were built from Noble Fir wood due to its strength. We are one of very few Garden Centers to sell this tree, as the freight costs more than the trees ! These are the first to sell out so shop early for this unique specimen. This unusual tree is grown in Pennsylvania. Concolor has long, soft needles of a bluish-green color with a very unique citrus scent. This tree has a gorgeous shape and is the second type to sell out! This popular tree is also grown in Pennsylvania and has short, soft needles on strong branches. Douglas fir tends to be very thick and wide at the base. 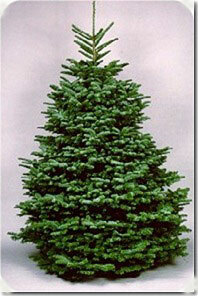 We carry Fraser firs grown in Pennsylvania and North Carolina. It has short needles that are green on top and silver underneath. This is the tree most consider to be the “traditional” tree. The Fraser Fir can only be grown at high elevations as temperatures above 70 degrees will cause needle drop during growth seasons. 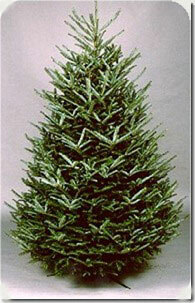 The North Carolina Fraser Firs tend to hold their needles longer than the Pennsylvania grown varieties.